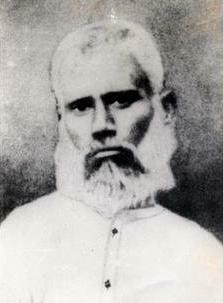 Baba Tajuddin Nagpuri (known as Taj-ul-Auliya) was a famous 19th century Sufi master or Qutub of Nagpur, India. He was maternal grandfather of Qalandar Baba Auliya (i.e. 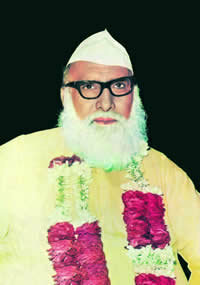 Muhammad Azeem Berkhiya r.a., founder of Silsila Azeemia). 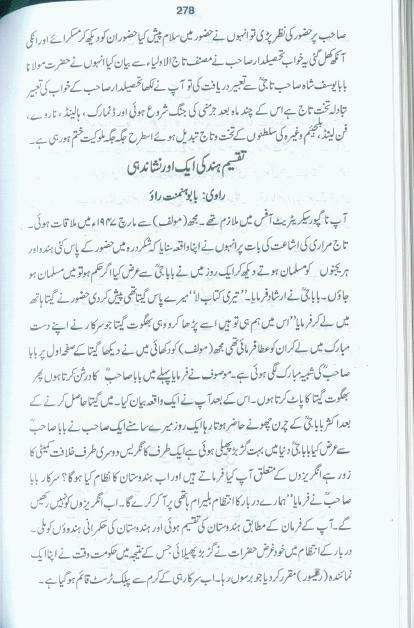 Allama Iqbal also corresponded with Baba Tajuddin in his life. Note: This post is just to emphasize the point that 'Creation of Pakistan' was a Divine decision. Auliya Allah foretold the division of Hindustan decades ago and they used to tell about this event in spiritual manners. 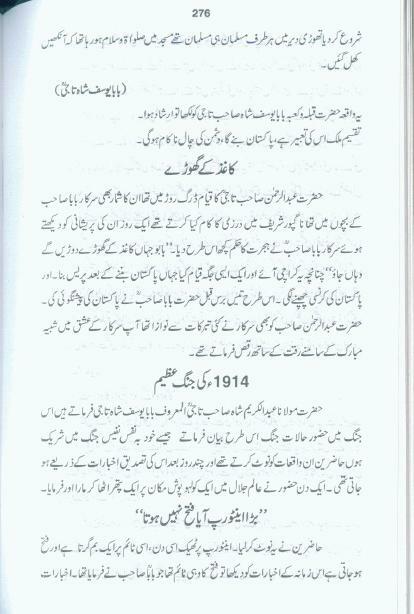 Prediction/Dream about creation of Pakistan & some spiritual events. 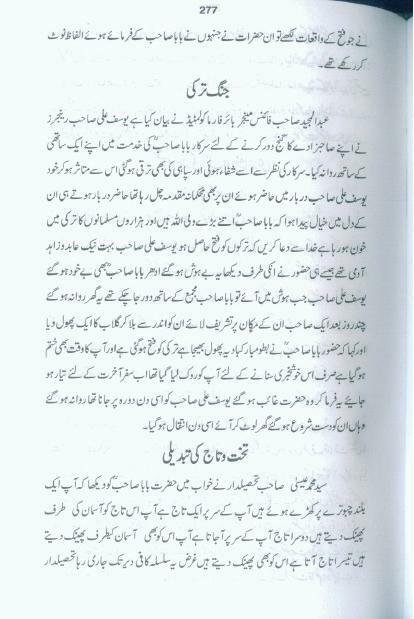 Correspondence of Allama Iqbal with Baba Tajuddin Nagpuri is also present at Pages 67-71 of Book: Azkar-e-Tajul Auliya. Book: Baba Tajuddin by Sohail Ahmad Azeemi was published in 1985, written under the supervision of Khawaja Shamsuddin Azeemi (Grandson of Maulana Khalil Ahmad Saharanpuri r.a.). 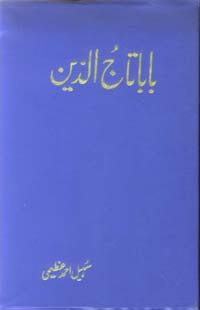 This book also contains another Booklet: Tazkirah Tajuddin Baba written by Qalandar Baba Auliya. 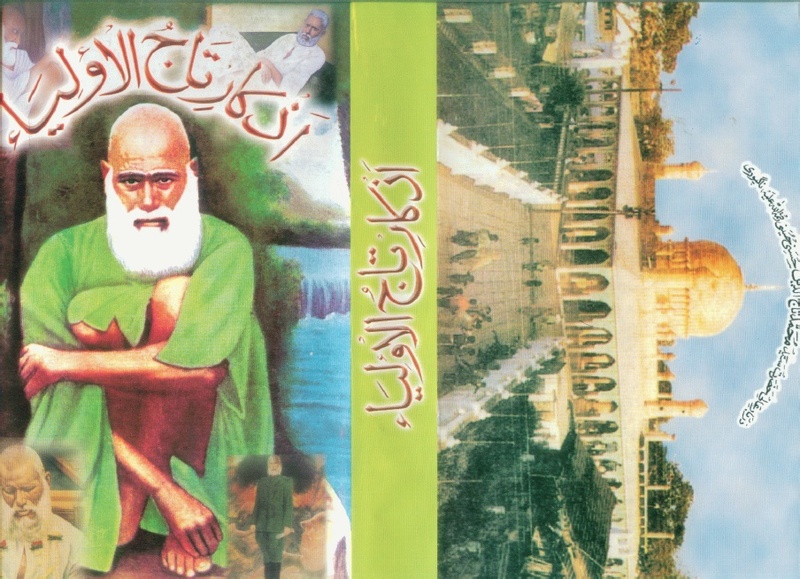 Another thing, two books written by Baba Zaheen Shah Taji (r.a.) are translation and interpretation of 'Fusus-ul-Hikm' and 'Fatuhaat-e-Makkiyah' (Famous books of Ibn-e-Arbi). Well this is really astonishing because these two books are said to be the most difficult books on Tassawwuf. Only a person who knows all the jargon of this field can translate such books. Insha'Allah Muslims from Makkah and Madina will conquer Pakistan and India again.... and remove bigotry and hypocrisy from our people. yes.now you have reached the truth. 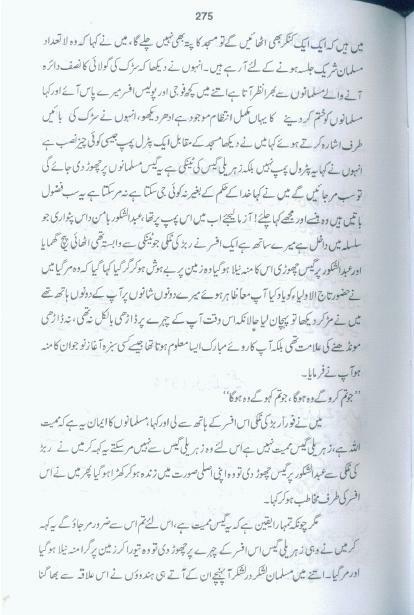 @Kashif, I believe in Hadith which told Imam Mahdi will send troops of his Khilafat to Sindh and Hind... Khurasani will help him in establishing Khialfat in middle east and also help him in Ghazwa-e-Hind but at that time other nations will also be belonged to these troops including Arabs Muslims, Insha'Allah... Also Khurasani people are Turkic people which are now spread from Turkey to India and China (East Turkmenistan or Kashger)..... Also conquering Pakistan or Sindh does not mean Imam Mahdi will attack on Pakistan and fight with us. He may conquer us spiritually or may send peace troops to protect us from India. Allah Knows Best. Hadith told us he will chain the leaders of hind and will use gold of hind to build and decor Masjid of Solomon a.s.
guys don't misinterpret what was told here. Did we get Pakistan by conquering as you are suggesting here? People always seem to assume that Imam Mahdi, peace be upon him, will be Arab. However, why could he not be one of the Ahl ul Bayt from Pakistan? we had 70 years time to establish islamic khilafat in this region in peaceful way.in my opinion this time has passed.we did no effort to establish islam in this region for which pakistan was specifically created via a miracle. so in my humble opinion now islamic system will have to be established in this region by "firm" means which may not be pleasant to jihad allergic seculars of this area. this may include fight among seculars (by name muslims or anti jihad muslims etc) and islam loving people of this area.atleast this i have gathered from years of reading end time books hadeeth and prophecies. lets see.things are moving fast these days. @" islamic khilafat in this region in peaceful way.."
Khilafat cannot be regional. It always be global. Insha'Allah Pakistan will be part of Global Khilafat. Yes it will be started from single point but it will spread across globe in less time. Center of Khilafat as predicted in Hadith will be in Mecca and Jerusalem. May Allah Tallah adorn pakistanis with sunnahs,may this country become the place for deen to be practised.May the idealogy of pakistan becomes la illaha illallah.Nothing in this world and hereafter escapes Allah Tallah.All things are but His decision.lets hope and that all pakistanis are good muslims. hi, im ibaadat from india kindly serve me the book name kutub-e-taji autobiograpy of sarkar tajuddin auliya nagpuri or any book of sarkar tajuddin auliya....written by yusuf baba taji pakistan....... do me a favour.